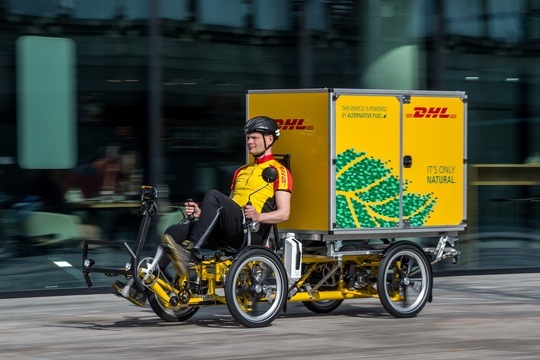 DHL Express is piloting a “city hub” trailer to enable the increased use of cargo bicycles for city deliveries. The city hub is a customised trailer that carries up to four containers for the logistics company’s “Cubicycle” cargo bicycle. A DHL van transports the trailer into the city centre and containers are loaded onto two bicycles for the last mile delivery. The trailer can then be replenished for outbound shipments. The bicycle is able to carry a container with a load of up to 125kg. “DHL Express has already replaced up to 60% of inner-city vehicle routes in some European countries with cargo bicycles, and we expect that the City Hub and Cubicycle will both help us to accelerate this approach in other markets over the next 3-5 years,” said John Pearson, CEO, DHL Express Europe. “Bicycles offer a number of advantages in express delivery operations: they can bypass traffic congestion and make up to two times as many stops per hour than a delivery vehicle. According to DHL Express, each of the hubs replaces up to two standard delivery vans.